Where In The World Is Carmen Sandiego? made learning about the countries of the world thrilling and fun when it was first released for the Apple II in 1985. In a new book called Break Out: How the Apple II Launched the PC Gaming Revolution, author David L. Craddock tells the story of how a small team at the game publisher Brøderbund brought Carmen to life, and how the genesis of the project was inspired by early text-based computer games like Colossal Cave Adventure. “One thing I’d always wanted to do, and had even worked on a little bit in the past, was trying to make adventure games more approachable,” said Brøderbund programmer Dane Bigham. The following is an excerpt from “Break Out: How the Apple II Launched the PC Gaming Revolution,” a new book by David L. Craddock, available September 16 from Schiffer Publishing. Like so many of his peers in the nascent games industry, Bigham had been both captivated and frustrated by Colossal Cave Adventure. Because the game’s thesaurus was so limited, players had to rack their brains to come up with the exact synonym the game was looking for. The problem, as Bigham saw it, was that Colossal Cave’s authors had been constrained by the technology of the day. Before it became a physical space, the rubber room started as an idea. Elliott and Portwood exchanged banter in the hallway while conversing with colleagues, and then continued discussions in their office. Programmers and artists began popping in to ask for their input. Ideas swirled, and inspiration struck like bolts of lightning. Portwood tended to be at the center of creative storms. Portwood and Elliott listened as Bigham laid out his idea: an adventure based on the children’s game of cops and robbers. Portwood had the clout to get away with pulling practical jokes. Bypassing college and landing a dream job on Disney’s animation team in 1950, he hit the canvas drawing, illustrating scenes for iconic films including Lady and the Tramp and Sleeping Beauty. Portwood joked that his expertise lay in crickets: He drew hundreds of renditions of Jiminy Cricket that welcomed viewers to the anthropomorphized conscience’s weekly TV show. The 1940s and ‘50s were not profitable for the “House of Mouse.” Portwood ended up taking jobs at banks to provide stable income for his family. An artist at heart, Portwood kept a close eye on emerging forms of animation—computer games in particular. A chance series of events led to him befriend Doug and Gary Carlston, who hired him in late 1980. Portwood and Elliott’s rubber room doubled as the staging ground for some of Portwood’s best gags. One recurring joke was impersonating programmers looking to get software published by Brøderbund. He’d throw together prototypes, brand them with hilarious titles, and write letters under aliases, such as an arrogant programmer who declared that Brøderbund should feel privileged that he deigned to submit his masterpiece. Bigham pared down the idea. Instead of pursuing two thieves at once, players would chase one. Focusing on a single criminal at a time would keep the menu simple and the screen more organized. Portwood nodded, warming to the notion. Players would track criminals by analyzing clues and determining which menu option to select based on solutions to the clues. Siefkin did some of his best writing in quiet, scenic spots. He gathered his writing supplies and headed to Strawberry Canyon, an outdoor pool on the Berkeley campus. Stretching out in a lawn chair beside a three-lane pool, he thought about how the game might be structured. Siefkin was well-versed in text-adventure tropes. A friend at Berkeley had introduced him to Colossal Cave Adventure, helping him get the hang of typing in commands for the text parser to analyze. Siefkin got sucked in; he loved the precept of solving puzzles to advance through rooms and collect treasure. For Brøderbund’s game, however, he imagined a much larger scale. After deciphering half a dozen clues or so, players would apprehend the criminal and recover the treasure. From there, another case featuring a villain and treasure would begin. Brøderbund approved Siefkin’s early script, which he clarified was more an outline of ideas: incorporate real-world clues based on information from the World Almanac to send players hunting around the globe. Carmen Sandiego suited another purpose. 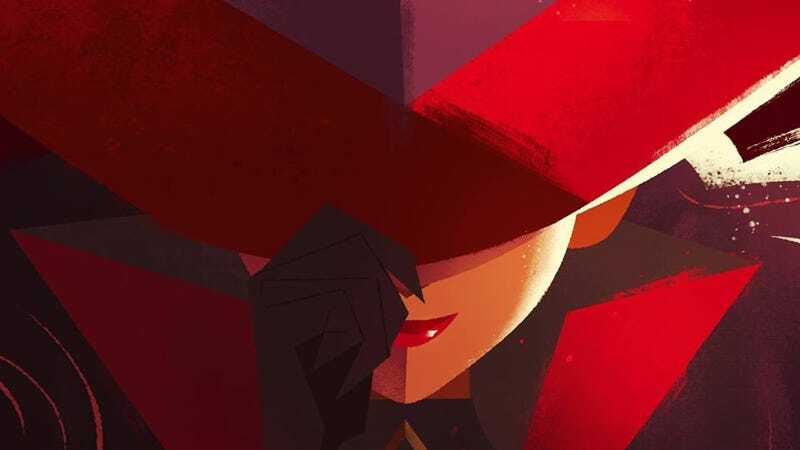 The game would be called Where in the World is Carmen Sandiego?, a title that succinctly communicated the player’s ultimate objective: track down Carmen and arrest her. But players couldn’t bring Carmen to justice right away. She was the proverbial carrot on a stick, the final boss that players only encounter once they have cleared a path through her lackeys. Piecing together a structure that would function as both an ongoing narrative and a game structure, Bird and the development team created two organizations. The first was V.I.L.E., or Villains’ International League of Evil, a cast of thieves. There was Katherine Drib, whose last name was an anagram of producer Katherine Bird. Carmen herself was modeled after Marsha Bell, Brøderbund’s manager of marketing services from 1984 through ‘89. “Most of the characters were, in fact, different employees of the company,” Doug Carlston says. “People enjoyed dressing up and coming up with names and so forth. They tried to get as wild and outside-the-box as they could.” Other names were coined as puns—Anita Bath was a play on I need a bath, while Ken U. Sparadigm worked out to Can you spare a dime. Capturing Carmen and her band of thieves took a backseat to compulsive gameplay. Players start each game session in a country where a crime occurred, and receive a strict, to-the-minute deadline—say, Wednesday, June 3rd, at 5:00 p.m. Their goal is to gather clues by selecting options in Bigham’s menu interface, which lets them interview witnesses at major landmarks. For example, a witness might recall the suspect converting his or her currency to pesos. When players feel they have gathered sufficient clues, they pull up the travel menu and jet off to the country indicated by the clues. Witnesses either express confusion to their inquiries, indicating they guessed wrong, or perk up and offer new intel. As players follow breadcrumb trails and advance in rank at ACME, cases become tougher. Time limits grow tight, and clues befuddle. “I remember there being discussion about the categorization of clue: what was easier, what was harder, and how to move people through that,” says Bigham. “The one major change I asked for was that it focus on the big stuff, like where Australia is, before getting into the currency of Lesotho,” adds Gary Carlston. As much a game as an educational program, Carmen introduces elements of suspense and reward to player actions. Actions like interviewing witnesses, traveling, and sleeping drain hours from the allotted time given to complete a case. Witnesses gradually divulge particulars about the suspect, such as gender, hair color, and notable features like tattoos and the automobile they drove. Players must enter those details into their crime computer in order to eliminate false leads and obtain a warrant for a specific criminal. Arresting the wrong person, or failing to obtain a warrant, botches the investigation. As players close the gap, suspects grow desperate and aggressive. Traps, like flowerpots falling from window sills and knives hurled from off-screen, signal that players are nearing a confrontation. When they smoke the suspect out of hiding, an animation of a chase sequence ensues. Back at HQ, players receive a letter of commendation and an update on how many cases they need to solve before they receive a promotion. Near the end of Carmen’s development, another Lode Runner conversion came up on the docket. To Bigham, porting Doug Smith’s game over to the Mac was a chance to work on a game guaranteed to be a hit, and a return to the types of games he enjoyed. Before he could pounce, another Brøderbund programmer scooped up the project. Bigham returned to Carmen, dejected. Another opportunity came up right away. Dan Gorlin, author of Choplifter, had founded his own studio, Dan Gorlin Productions, down the street from Brøderbund. Impressed by Bigham’s coding skills and work ethic, Gorlin extended him an offer. Bigham returned to his desk. As he worked, his resentment toward the project grew. Brøderbund had hoped to ship the game in 1984 and had promised a bonus for finishing early. January 1985 rolled around, and Carmen still wasn’t done. Bigham’s bonus check slipped through his fingers. Break Out: How the Apple II Launched the PC Gaming Revolution by David L. Craddock is available September 16. Top image: Houghton Mifflin Harcourt.